Laughter is the best cosmetic! Benefit is a fast, fun and fabulous cosmetics brand that will instantly solve every girl’s beauty dilemmas. Founded in 1976 in San Francisco by dynamic twins Jean and Jane Ford, Benefit’s cult ‘fake it’ products and gorgeous bold and girly packaging prove the Benefit mantra that ‘makeup doesn’t have to be serious to look good’. First stop? Their best-selling, high performance brow products. Fool proof and easy to use in up to six shades, they’ll instantly transform your brows from now to wow. 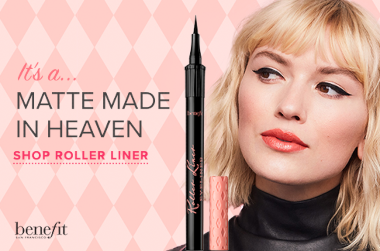 No need to stop there - check out one of Benefit&apos;s best-selling mascaras. Whether you&apos;re looking for dreamy length, volume or curl Benefit have got you covered. If you want lashes that just don&apos;t stop try layering your favourites - layer They&apos;re Real over Badgal Bang for lashes with incredible length and volume. For a volume and curl combo that will be sure to stun, apply Roller Lash followed by Badgal Bang - and if you&apos;re really after the ultimate lash finish with a layer of They&apos;re Real. Benefit are also known and loved for their cheek products, from cult classic bronzer Hoola to new kid on the block, Gold Rush. And the best part? They&apos;re all available in a mini size, perfect for handbags and travel! Lips get love too with a range of products from tints and stains to a lip liner/lipstick combo that instantly creates a fuller-looking lip. Official Stockist of Benefit Cosmetics. Showing 20 products of 110.
feels like paint you use in kindergarten, if your prone to acne - don’t use this foundation .